The Phoenix Zoo celebrated its 50th anniversary in 2013, is one of the younger major zoos in the country. Not only is it a successful zoo, but it is a privately owned nonprofit zoo. That means that it operates strictly without any government funding. The Phoenix Zoo is totally supported by donors and private organizations. The Phoenix Zoo has more than 1,000 animals on exhibit. Because the Zoo makes a special effort to provide the animals with appropriate habitats, some of them may be a challenge to see. Keep looking! Gone are the days when it is enough for a zoo to showcase cute animals. Recognizing the important role that zoos must play, the Phoenix Zoo has been very active in wildlife conservation programs. According to the Phoenix Zoo website, "The Zoo participates in numerous local and international efforts on behalf of endangered species, including the Mexican wolf, thick-billed parrot, black-footed ferret, Bornean orangutan, Sumatran tiger, Asian elephant, and many more." Phoenix Zoo Tip: If you want to see everything at the Phoenix Zoo, it will take several hours and quite a bit of walking. The Phoenix Zoo has about 2-1/2 miles of walking trails. There are several different sections on 125 acres to visit at the Phoenix Zoo. The Arizona Trail, the Africa Trail, the Tropics Trail, the Discovery Trail and the African Savanna are the major areas, and there are many different animals to see and learn about. When you aren't looking at Gila monsters and giraffes and raptors and elephants, you can take a pedal boat ride in the lake, or enjoy a snack, or take a leisurely ride around the zoo on the Safari Shuttle. The youngest Zoo patrons might be happy spending their entire day at Harmony Farm. The Red Barn Petting Zoo is home to several animals that the children can touch. There are playgrounds, and, in the summer, splash areas. My one Phoenix Zoo Gripe: I love the Phoenix Zoo, but my one complaint involves an exhibit called the Forest of Uco. The endangered Spectacled Bear is a major attraction there. There are two bears. It's a long walk, and it is deliberately designed to make it a private habitat for the bears, totally fenced with vines on the fences and wild bushes around the perimeter. People will wander around that enclosure for quite a while trying to get a glimpse of a bear. It's just too hard to find them, and on the occasions that I do, it's a bit anticlimactic. Now that I've seen them, I skip the Forest of Uco when I go to the Zoo. I'd rather spend my time elsewhere -- there's so much more to see and do. Phoenix Zoo Tip: You may bring coolers, ice chests, and your own food, but no alcohol or glass. You may bring your own roller blades or bike to use while visiting the Zoo, but no skateboards or scooters. Shoes are required. The following items are also not permitted at the Zoo: balloons, balls, frisbees, radios, whistles, weapons (real or toys), knives. Smoking is prohibited at the Phoenix Zoo. For an additional fee, there are some popular rides and adventures that are offered at the Phoenix Zoo. Ride the Endangered Species Carousel. Available continuously. Take a 25 minute trip around the Zoo on the Safari Train. Trains leave every 20 to 30 minutes. Visit the Stingray Bay and touch a real stingray. Available continuously, feeding at scheduled times. Ride a camel. Available continuously. Feed giraffes at Giraffe Encounter. Available at scheduled times. Take a private one-hour custom tour of the Zoo in a Safari Tour Cart. Available by arrangement. Navigate around the lake in a pedal boat that you can rent. Phoenix Zoo Tip: Although there are mature trees and shady areas around the Phoenix Zoo, make sure that you prepare for the sunny and warm days by carrying a bottle of water, wearing sunscreen and bringing a hat. During the summer, get to the Zoo early, early, early or you'll be too hot and won't see many animals. Check the Phoenix Zoo's event calendar for concerts, special events, camps, special exhibits and holiday fun. Here are a few that are highly anticipated annual events. ZooBrew - beer and bands. Starry Safari - summer evenings with water slides, inflatables, animal meet and greets. ZooFari - Food and live music and entertainment. Boo at the Zoo - enjoy Halloween activities at the Phoenix Zoo. ZooLights - from late November through early January the Zoo is decorated for the holidays. There are more events throughout the year at the Phoenix Zoo. Check the event calendar to see what's going on this month. Phoenix Zoo Tip: There are many ways that people can become involved at the Zoo. For kids, make sure you check in the springtime for summer camp programs. For the adults, there are always volunteer opportunities. The Phoenix Zoo is open 364 days per year, rain or shine. It is closed on Christmas Day (except in the evening for ZooLights). During the summer (June through August), the Phoenix Zoo opens early at 7 a.m. and closes earlier in the afternoon so that visitors have a better opportunity to see animals out and about before it gets too hot. During other times of the year, the Zoo opens at 9 a.m. September through January there are several special events at the Phoenix Zoo, so you'll want to check online or by phone to determine the hours they are open. The Phoenix Zoo is located in Papago Park, not far from downtown Phoenix and about 10 minutes from the airport. It is north of Van Buren on Galvin Parkway. The entrance to the Phoenix Zoo is off Galvin Parkway in Papago Park, between McDowell and Van Buren. From the north and northwest: Take I-17 South to I-10 East to the 202 East (Red Mountain Freeway). Exit at Priest Drive. Go north (left) on Priest, which becomes Galvin Parkway. Turn right at the first light north of Van Buren into the Phoenix Zoo parking lot. From Scottsdale: Take the 101 Loop South to 202 West (Red Mountain Freeway). Exit at Priest Drive. Go north (right) on Priest, which becomes Galvin Parkway. Turn right at the first light north of Van Buren into the Phoenix Zoo parking lot. From the south and west: Take I-10 toward Phoenix to the exit for 143 North (Hohokam Expressway). Take that to the 202 East, and exit at Priest Drive. Go north (left) on Priest, which becomes Galvin Parkway. Turn right at the first light north of Van Buren into the Phoenix Zoo parking lot. 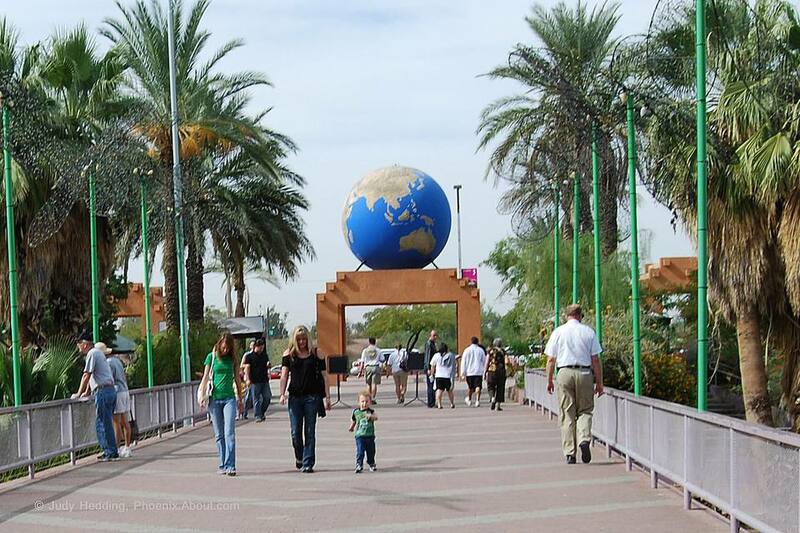 There is no Valley Metro Rail station within a reasonable walking distance from Phoenix Zoo. You can take light rail to the Washington / Priest station and from there connect to the Route 1 Bus. Use the Valley Metro Trip Planner to figure out how long that will take. You can buy tickets to the Phoenix Zoo in advance online and skip the lines. There aren't many coupons or discounts offered for Phoenix Zoo admissions, but you can check for tips on discounts to the Phoenix Zoo and find out about how you and your family can have free daytime access to the Zoo all year long by purchasing a membership. Phoenix Zoo Tip: From time to time some exhibits and rides are closed for maintenance or repair. If you are going to the Zoo because you want to see or do something very specific, you might call first to make sure that that exhibit or adventure is available on that day. The phone number to get information about the Phoenix Zoo is 602-273-1341.